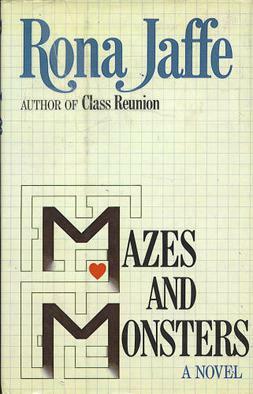 Straight out of 1979, with a cool glass of white wine and an extremely wide collar, comes Rona Jaffe’s disturbingly fictionalized account of a disturbing apocryphal tale, Mazes and Monsters. What promises to be a stirring exploration of the dangers of role-playing games quickly pivots into a fairly detailed account of … divorce being hard. With a morality derived from TV for children and a sense of mental illness that would leave an X-Men comic shaking its head and muttering “Jeez, that ain’t how that works”, Mazes and Monsters brings the disappointment from some unusual angles. Even though it’s extremely short, it’s worth noting that we never talk about some parts of it, like the fact that after a while, they stop playing Dungeons and Dragons in a dorm room and start acting it all out in some nearby steam tunnels, because those parts literally don’t matter. Finally, if you want to get up to speed on the book without having to read it, knowing that we strongly recommend you do not read it, you can do so by reading a Chick Tract (but please don’t give them any money). NOTE FROM J TO EX-BOY SCOUTS: Yes, I know it’s actually called a “Totin’ Chit” and not a “Woodsman’s Chit”. I was very tired. Please forgive me.